Rapid data growth of traditional and new data sources is putting a strain on existing Enterprise Data Warehouse (EDW) resources and related IT budgets. 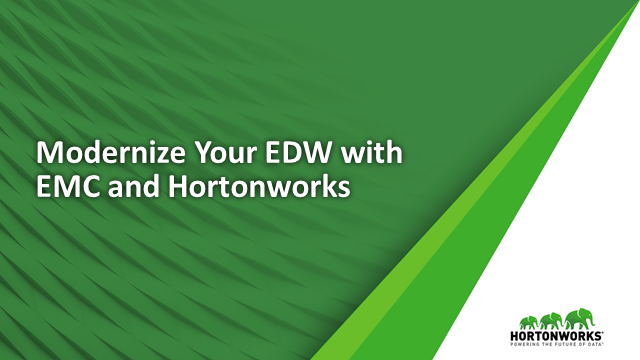 Learn how to reduce the cost of an EDW by augmenting it with an EMC Data Lake and Hortonworks Data Platform (HDP). Today, Enterprises simply can’t afford to keep all data and often have to discard or aggregate it before storing. Increasingly, EDW resources are also being used to handle the data wrangling and cleansing jobs instead of performing higher value-add analytics and Business Intelligence workloads. These challenges have driven many enterprises to look for ways to optimize their EDW by on-boarding lower value data storage and processing functions to a more affordable data lake platform that extend the value of their EDW and enhance their business intelligence activities. Not only will you get more value out of EDW investments, but by introducing EMC Isilon in combination with HDP, you have extended your datacenter to capture more data for longer, giving you more advanced analytics capabilities. Join us for this webinar to hear from EMC and Hortonworks on how customers transformed and modernized their Data Warehouse.